For the past 38 years Dean Mathis has been guided by a day-by-day encounter with the hero of his life -- God! And that encounter has enabled him to pastor successfully for a quarter of a century right here in Hobbs. Mathis, who grew up in Eunice, will be honored today and on Sunday for 25 years of wise and dedicated leadership at Taylor Memorial Baptist Church. He credits his success with having a moral obligation to lead people into a growing relationship with Christ and to strengthen the church where he pastors. Mathis says things might have been different in his life if he hadn't accepted the spiritual challenge, when God called him at the age of 13 to preach. He recalls times in his life when he had to act ethically strong and make wise decisions because other youth looked up to him. "I could have done some foolish things," he said, "but I chose instead to earn the respect and honor of my peers." Mathis said love for his parents also caused him to act justly. "I didn't want to bring shame upon my mom and dad," who he said as long as he could remember, were strong Christians, active in the church. His father was a deacon. 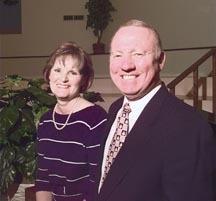 Out of the family's religious involvement in the church, Mathis and his brother, Bob, both became servants of the Lord. Bob Mathis, who will speak Sunday at his brother's anniversary, is professor of administration at the Southwestern Baptist Theological Seminary in Fort Worth, Texas. Following graduation from Eunice High School in 1962, Mathis attended Wayland Baptist College in Plainview, Texas, where he received his bachelor of arts degree. He received his master of divinity from Southwestern Baptist Theological Seminary and obtained his doctor of ministry degree from Luther Rice University. One of his first ministerial positions was campus minister at El Centro College in Dallas, Texas. From there he went on to Clarksville, Tenn., where he served as associate pastor. While in Clarksville, he learned of the vacancy in Hobbs and applied for the position. It didn't take the pastor's search committee long to realize Mathis was the man they wanted to be their shepherd. Mathis, who wanted to return to Lea County, gladly accepted the appointment and on June 3, 1975, became pastor of the church. His only regret is he wishes he had been a better academician in Greek and Bible courses. "If I had made the extra effort in seminary, I might have done some things a lot better," he said. Other than that, Mathis says life has been very rewarding and from it he has gained valuable experience. That experience has enabled him to offer the membership at Taylor Memorial Baptist a rewarding worship encounter centered around the Bible and Christian music -- all designed to draw each person closer to Christ. Under Mathis' leadership the church now offers special ministries projected for pre-school children, youth and adults. When Mathis became pastor of Taylor Memorial, the Sunday school enrollment was 587. Today it is now 1,219. Church membership was 837 and now it is 1,837. During his years at the church, there have been 898 baptisms and more than $2.5 million has been given to missions. The staff has grown to meet the needs of the people and now includes specialized workers in education, music and student ministry. In 1982, Taylor Memorial built a 15,000-square-foot educational building costing approximately $700,000. The church built a cabin facility in 1986 in Glorietta, costing $250,000, and in 1990, the congregation built a 20,000-square-foot $800,0009 educational building. The church is debt free and recently purchased two new buses to further its ministry in the community and state. During the past 25 years, Mathis has become an active member of the community. He has been a member of the Rotary Club and Ministerial Alliance. He has served as police chaplain. He was a past member of the committee on boards for the Southern Baptist Convention, a member of the Southern Baptist Executive Committee of New Mexico and a member of the board of trustees for the Southern Baptist Convention Sunday School Board. In addition, he has written for the Southern Baptist Convention literature. Even though Mathis is proud of the accomplishments that have been made under his pastorage, he is not boastful. He says he realizes each achievement gained was done through prayer and hard work. And though sometimes he worries about the moral decline in the country, he stays optimistic and positive by continuing to strengthen his own spiritual growth to help others grow in Christ. "If I can't help someone, I will tell them I know someone who can. After all, everything we do is directed by purpose in history and I'm excited to see what he (God) is going to do next," said Mathis of his clergy and counseling work. He said if people center their life around God, no matter what turmoil is going on in their life, they will win in the end. The celebration will begin at 5 p.m. today with a fellowship dinner and program, titled "This Is Your Life." Tickets for the dinner are $3 for adults and $2 for children, age 5 and over. On Sunday, the service will begin at 10:30 a.m. In addition to Mathis' brother speaking, the Rev. Claude Cone, executive secretary of the Baptist Convention of New Mexico, will also join in on the celebration. Also present for the festivities will be his wife, Betty Sue, of 34 years; his mother, Faye Mathis, of Burleson, Texas; his daughter, Temple Odom, of Lansing, Mich., and her husband; and his son, Ross Mathis, of Plainview, Texas, along with his wife and children. All members, former members, friends and relatives are invited to attend the services.